Before we talk about what flavour wheel is and what it really means, let’s try to understand taste and flavour. Taste is the one of the sensory mechanisms that has been created to test matter before consume.This phenomenon happens via gustatory cells (or taste buds otherwise) which have been located across the tongue and along the throat. Those taste buds have the ability to recognise the molecules or ions which are responsible to sweetness, sourness, saltiness, bitterness and savouriness (umami), individually. Therefore, we can understand that flavour recognition mechanism occurs within nose, tongue and brain. When olfactory epithelium being hit by volatile particles while taste buds are detecting H+, Na+, Sugars, some of the proteins and alkaloids, TASTE become FLAVOUR. Coffee tasters flavour wheel has been made to evaluate a coffee in more productive and detailed manner. The two major categories, tastes and aroma together describe the “flavour” aspect of the wheel. Here we are to talk about rather aroma category in order to understand the structural view of the wheel. 36 of most common aromas have been identified by the way they produced and structured within the right side of the wheel under enzymatic, sugar browning and dry distillation sections. Enzymatic category holds the floral, fruity and herby characteristic of coffee. Coffee bean contains some percentage of phenolic compounds.Because of the resonance structure of the benzene ring of phenolic compound,there is higher electron density occur between oxygen and carbon atom. This higher electron density bias most of the phenolic compound towards oxidation, even by the oxygen of atmosphere. There chemical reactions usually are active around pH 5-7 within bean’s cells. Now, those chemical compounds that created by above reactions are more likely to have floral, fruity and herby aroma characteristic, therefore, those aromas have been categorised as enzymatic. 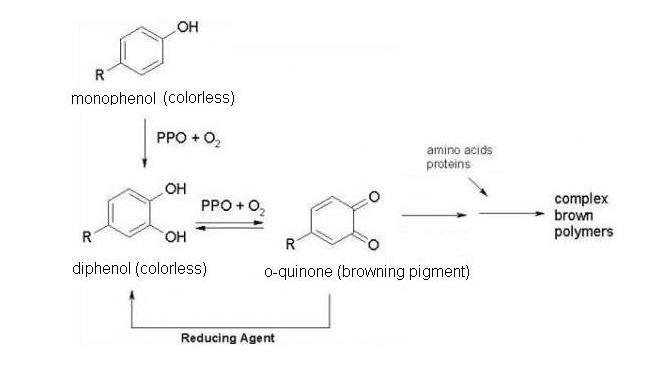 As an example we can see by above reaction of Polyphenol oxidise,complex brown polymers have been created via PPO (polyphenol oxidise). These reactions usually turn apples into brown once they connect with oxygen. Therefore, any chemical compounds that can be produced through above reactions are more like to have floral, fruity and herby aromas. Sugar browning category holds the Nut, Caramel and Chocolate types of characteristic of coffee. Aromatic compounds creation via sugar browning, happen because of two different chemical reactions. Those are caramelization and Maillrad reaction. Maillard Reaction : is one of the most fascinating reactions in chemistry. It was understood and published by French scientist Louis-Camille Maillard. Maillard reaction is a non enzymatic browning reaction which occurs under heat (140’C -165’C) by having sugars, amino acids compounds as reactive. 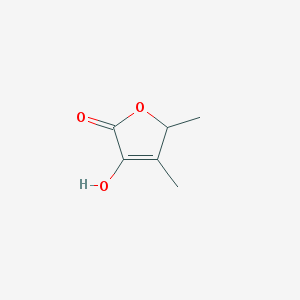 One of the most important things that we should understand here is that sucrose will not be a reactive in this chemical reaction but any sugar that has an aldehyde arm. There are three main most important stages in Maillard reaction. First stage reaction is the formation amadori/Heyns compounds.In the second stage amadori/Heyns compounds decompose to most important heterocyclic chemical compounds that responsible for number of wonderful coffee aromas. The third stage of the reaction is the production of melanoidins. Chemical mechanism of this production is still unclear. Melanoidin is a brown pigment which has higher molecular mass as well as an undefined structure. If we look at melanoidin and coffee chemistry together we can probably say, that coffee is brown because of the production of melanoidin. Dry Distillation category holds the resinous,spicy and carbony, characteristic of coffee. Coffee seed contains abundance of fibres within its cells. As coffee roasting is a very intense process, immense heat can burn the fibrous materials of the seed. Therefore, any chemical compounds that can be produced through above reactions are more like to have resinous,spicy and carbony aromas. Therefore depending on the chemical composition of the seed, oxygen and roasting temperatures together can create wonderful flavour experience to our coffee with surprisingly unexplained melanoidins structures. Finally, better understanding of the flavour wheel can open a new scientifically profound aspect to our coffee sensory experience. Rather than just having it sticked to our sensory lab wall. Tags: barista, chemical compounds, chemical reaction, chemical reactions, chemistry, coffee, coffee chemistry, coffee cupping, coffee quality, coffee roasting, coffee science, dose, espresso, extraction, flavour, gastronomy, grind, latte art, Maillard reaction, SCAE, sensory triangulation, speciality coffee, taste. Bookmark the permalink.